A reciprocal educational exchange program (REEP) is a Texas A&M University sponsored program that gives students the opportunity to take courses directly at a foreign partner institution. The REEP model is one of the most independent and immersive ways to study abroad, giving students the opportunity to live and learn with students from the host country, as well as with other international exchange students from across the globe. REEPs are ideal for independent and proactive students who will have the flexibility to adjust to different styles of teaching/learning and course expectations. REEPs are available for semester and/or academic year study, with limited programs during the summer term. Students pay regular TAMU tuition and fees as if they were studying on campus, making REEPs one of the most cost-effective ways to study abroad. Living expenses are typically paid on-site to the host university. Students have access to the host university's course offerings (some restrictions may apply) and take courses alongside host country nationals. REEPs provide a truly immersive experience, allowing students to get involved in the local university community through clubs, sports, and other student activities. Transfer students must have completed one semester at TAMU prior to application. Must have language proficiency (3-4 semesters of college-level language studies) if English is not the language of instruction at the host university. Explore the university-wide and college/departmental REEP programs. Meet with the Study Abroad Programs Office REEP advisor or the college/departmental coordinator responsible for the REEP that interests the student. Create the TAMU REEP application by clicking the “Apply Now” button on the program-specific webpage. Once the application is complete, it will be reviewed by the REEP selection committee (for university-wide REEPs) or by the program coordinator (college/departmental REEPs). If the application is approved, you will be notified and asked to confirm your participation, after which you will be officially nominated to the host university. After being nominated, you will receive instructions on how to complete the host university application. Complete all pre-departure application items in the TAMU study abroad application. Texas A&M University has established exchange agreements with a number of universities in Asia, Europe, Latin America, and Oceania that permit TAMU students from any college to study at those universities. To view a list of all of the university-wide REEP programs, click here. 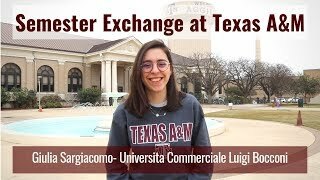 Several of Texas A&M University’s colleges or departments have established exchange agreements with overseas institutions specifically for their majors. Each of these programs has its own coordinator within the respective college or department, who should be contacted with program-specific inquiries. To view a list of all of the college/departmental REEP programs, click here. See the program brochure for the program-specific coordinator.